Chelsea and Newcastle lock horns at Stamford Bridge on Saturday's lunch-time kick-off. Will the Blues ensure they do not lose further ground on the top two by claiming all three points? 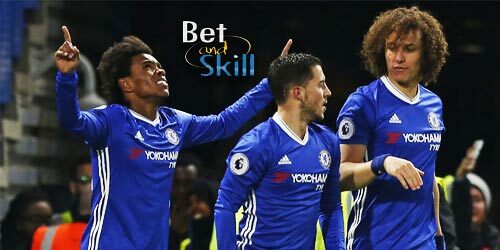 This article contains our Chelsea vs Newcastle betting preview with free predictions, betting tips, lineups, team news, best odds, betting promotions and no deposit free bets on this weekend's matches! Chelsea did just about enough to beat Swansea (1-0) at Stamford Bridge on Wednesday evening, making it five wins and a draw in last six Premier League fixtures. The Blues have been very convincing in front of the home fans recently and we’ve seen them beat Watford (4-2), Everton (2-1), and Manchester United (1-0) in last three games. Antonio Conte's men have conceded no more than a single goal in their last five league outings and boast the third-best defensive record in the entire league. Furthermore, Chelsea have won their last 4 home matches against Newcastle in all competitions. After being omitted from the first XI against Swansea City in midweek, Eden Hazard, Tiemoue Bakayoko and Cesar Azpilicueta should all be recalled, respectively replacing Antonio Rudiger, Willian and Pedro. This means that the Blues will return to a 3-5-1-1 system, with Hazard behind the lone striker Alvaro Morata. Victor Moses made his first appearance in six weeks on Wednesday and will push for a starting berth, with Davide Zappacosta making room. Michy Batshuayi is a doubt while the likes of David Luiz, Kenedy and Charley Musonda are set to remain sidelined. Newcastle ended a run of four straight defeats at West Brom on Tuesday as they came from 2-0 down to draw 2-2. The Magpies have now won only one of their last nine games in the top flight – and that was against rock-bottom Crystal Palace several weeks ago. Plus, they have picked up only five points on their travels in the Premier League this season. The newly-promoted outfit have become increasingly unstuck due to a lack of quality in front of goal, scoring just three times in the last 5 fixtures. .Despite the poor run of results, Rafa Benitez's men are still in 12th place in the table - just two points behind Leicester in ninth. Rafa Benitez rotated heavily against West Brom in midweek, so more changes are expected for this trip. Robert Elliot should be restored in goal, as well as Javier Manquillo in defense and Jonjo Shelvey in midfield. Given the quick turnaround between matches, Aleksandar Mitrovic or Dwight Gayle could start here given Joselu woes in front of goal. Jacob Murphy, Ayoze Perez and Matt Ritchie should be the offensive midfield trio with Isaac Hayden and Mikel Merino in contention for a starting berth at the base of midfield. Paul Dummett, Jamaal Lascelles and Christian Atsu remain out. "Chelsea vs Newcastle betting tips, predictions, lineups and odds (Premier League - 2.12.2017)"